WASHINGTON—Armed with newly acquired strategies on team leadership, effective communication, and workplace sensitivity, President Barack Obama returned to the Oval Office this morning after spending the past three days at a management seminar, White House sources confirmed. The professional-development conference reportedly took place at the Marriott Marquis in downtown Washington, where the president joined dozens of business managers from across the mid-Atlantic region for a series of presentations, workshops, and team-building activities aimed at enhancing supervisory skills and fostering confident decision-making. The commander-in-chief stated that, to his surprise, he even found himself enjoying some of the seminar’s activities. In particular, Obama cited an afternoon “brain-building” exercise on day two, during which he and his teammates Don Worley and Jim Meredith, both from Baxter Tour & Travel Motorcoach Lines, were handed three seemingly random objects—a roll of tape, a tube of toothpaste, and an egg carton—and then given 30 minutes to come up with a new product and create a business model for marketing it to consumers. In the role-playing session “Tough Scenarios,” sources said Obama was paired up with Wilmington-based PR director Mary Westgerdes and presented with a series of management predicaments to act out in front of the group, such as how to confront an employee about dressing professionally and what not to say when addressing a subordinate of the opposite gender. 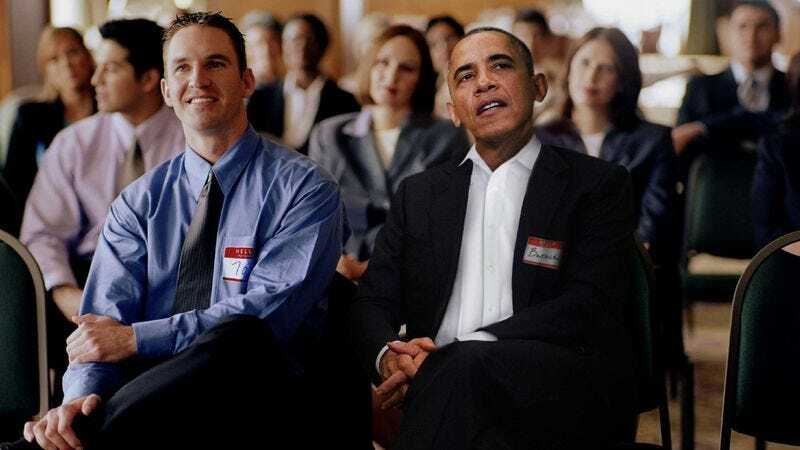 OnPoint Marketing Solutions, LLC founder Ron Davies, who taught the 44th president in the workshops “Critical Thinking, Analytical Thinking” and “Managing at the Speed of Trust,” said he enjoyed watching Obama’s progress over the course of three days. But Obama stressed that some of the best moments of the conference came when he got the opportunity to network and trade business cards with fellow attendees when he bumped into them in the Marriott hallway or during their scheduled hour-long break between morning and afternoon sessions when he and a few fellow attendees would head out to lunch at a nearby Panera Bread.